People born specifically on the 17th of June are predicted to be carefree with a love of excitement and change alongside the typical Gemini wit and adaptability. The astrological planet that rules this particular day is Saturn making you careful in your actions and highly creative and imaginative in thought. If you have this birthday a sociable, warm and communicative nature is bestowed upon you with a nonjudgmental dependable attitude. Intelligent, outgoing and quite ambitious you ordinarily have a dry sense of humor despite your strong serious streak. Individuals with a June the seventeenth birthday like to share information but are not as gossipy or nosy as most twins. You are usually full of common sense and responsibility and tend to generally approach life with optimism. Emotionally you can be a little childish, mistrustful and impulsive especially in your youth. Your facile temperament is kind and sympathetic but also prone to impatience and exaggeration. Career options are usually plenteous and varied to a person born on the seventeenth of June due to your versatility and many talents. You should particularly enjoy working in a job involving numbers or based on scientific areas. Accountancy is a popular choice, other preferred possible professions include being a doctor, dentist or lawyer. Doing something you are very good at is probably your ideal job. Financially you would rather save than spend and when it comes to contemplating investments you will be likely to opt for the safer route. Saving for a secure future is often of the upmost importance. For a Gemini, the person born on the seventeenth day of June is typically in need of a partner who can stimulate both their body and mind equally. You are inclined to be cautious in romance who you give your heart to and may have a bit of difficulty confiding in and trusting others. Your tendency to test and question everything extends to affairs of the heart but you try not to waste time when you meet your destined soul mate. The perfect love partner must share similar aspirations and be able to appreciate your humor and calm your nervous energies. You can sometimes find decision making and meaningful displays of affection hard so you could be a bit hesitant to commit to a long term relationship unless it feels completely right. Once settled in a loving committed partnership with someone special you are among the most loyal of your zodiac group. 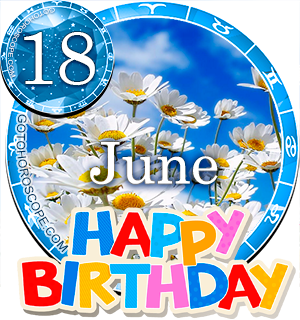 Health complaints experienced by those born on June 17th are once in a while a result of you not taking adequate care of yourself. This somewhat careless attitude and a proneness to not get enough sleep can lower your levels of resistance to common viruses. Your overall healthiness often improves when you live with others or gain dependants. People born on this day normally possess a healthy appetite and often adore experimenting in the kitchen. In order to keep fit you could find gentle sports are effective forms of exercise and also offer the opportunity to release built up tensions. Your main strengths of character are exhibited in the persuasive energetic wittiness and intelligence you express. This combination of positive traits and your seriousness when necessary give you the ease to easily adapt to any circumstance and be usually capable of seeing the bright side of things. When negativity creeps in the personality weaknesses for those born on June 17th can emerge. These unpositive characteristics can surface as an unwillingness to wait or a susceptibility to overindulgence. You also commonly have a habit of occasionally exaggerating to back up some of your opinions or intensify a point. Being born on the 17th of June means that you will be naturally desirous of success and highly enterprising. In spite of this desire, energy and resourcefulness you are often a bit unconfident in your abilities and pushing yourself forward. A fear of failure and taking risks can sometimes prevent you from achieving your full potential. Your colorful imagination, deep thought and high level of creativity guide your dreams to be fanciful and likely to include wishes for escapism from daily routine. Other hopes in life are to travel and experience some of the luxuries that life has to offer. As you were born on the seventeenth day of the month the one and seven in your birth date add up to a Root number of Eight. This numerical reference to your birthday has the keyword 'Leader' indicating your extrovert dependability, concentration and acumen. The Tarot card associated with your birthday is the 17th in the Major Arcana symbolizing the Star. This is a sign of your considerate kindness towards others and your responsible resolute side. The lucky gemstone chosen for June the seventeenth birthdays is a Black Pearl, to be worn for boosting prosperity, vitality, confidence and good luck. Each Gemini personality is believed to have it's probable characteristics astrologically influenced by the planet Mercury's power. The actual day you were born on, the seventeenth of June, is reigned over by Saturn's influence. Therefore this pair of planets are the two dominant authorities in determining your uniqueness. Your mix of lighthearted sociability and commonsensical intellect make you fun to be with but sensible. Your fondness of sharing knowledge and cheery mindful outlook gain you many friends throughout life. If you can conquer your hastiness and intolerance of inactivity it will give you more time to reflect. A completing thought for people born on June the 17th is to be more ready to trust your instincts and emotions and contemplate being more accepting of the differing views of others. Doing so should be very enlightening. Mmmm this is so shocking..this is 100%true..
How to save no ey .what is remedy. [just=left][/just][COLOR=Pink][/COLOR] this is very true! I've been feeling really down for the past 6 months, and I feel like I need to be in a relationship with someone who will fulfil me and someone I can also fulfil. I totally agree in all aspect except saving haha I believe most of us who were born on this date are not good in saving money based on my observation. True ..!! i have my talents as well. it is scary that the universe toys with us and others. this was spot on. Now all I have to do is figure out on what date was the perfect partner was born. Sooo true and my profession is dentist! My! This is soooooo on point I agree with all of it, except the savings part I'm very bad on that, I guess I need to work on it. If you put your mind on something you can achieve it, right? So, savings here I come, I'm gonna do that ish! mostly true concerned about the saving thing. nobody is perfect. 10 out of 10. Hey I was born on this day 617.. Geminians are Simply the BEST!!! Yeah that's perfectly right . all those who born on 17 June are extraordinary and creative. This is awesome.I am in scientific field . its true. On Point!!! Aside from the saving of funds... Definitely a spender!!! This is totally me except for the Finances/Career part. I'm terrible with numbers & science. Otherwise, I agree with the rest! I couldn't agree more. I never read horoscopes and am highly suspicious of them, however, the description outlined above is fairly accurate. I should know as my birthday is June 17th! Happy B-Day fellow 617's. Not a single word wrong. N i m in accountancy field.so correct. Please is this writer born on June 17? it rely correct. nice job writer. generally the facts are there but the year is totally another chapter to think about.